A friend who lives nearby and I decided to meet here for an impromptu dinner tonight. Funny that I’d never been since it’s a whopping 3 blocks from my apartment. Of course, I read some reviews online before going so that I knew what the best liked dishes were. The dumplings were mentioned repeatedly, so they were surely going to be ordered. When we arrived, it was pretty empty. Only 2 other tables had patrons and a third one filled by the time we left. It draws an older crowd, if I base my assessment on tonight’s small sampling of diners, and although the walls and ceilings are painted in rich hues of oranges, reds and pinks, it feels strangely stodgy. We were a little bummed to find they did not offer the crunchy noodles with duck sauce to munch on while we looked over the menu, but they did bring out a little bowl of peanuts and another of sweet, pickled cabbage and carrots that was pretty enjoyable. 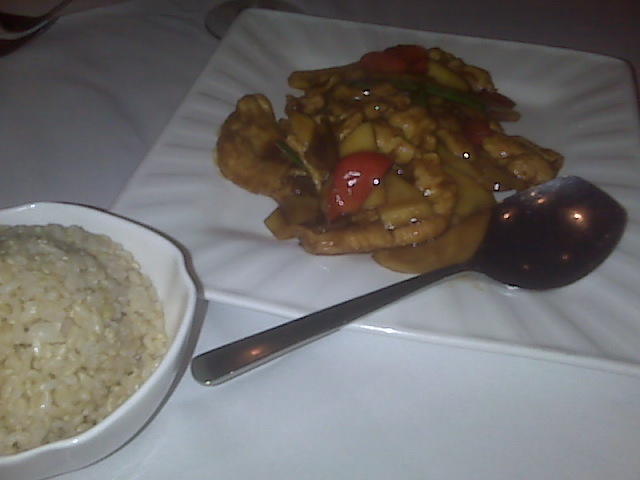 We shared the pork juicy dumplings to start and the mango chicken with brown rice as our entree. The dumplings really were excellent- some of the best ones I’ve had around here. Apparently, they use a small cube of frozen broth inside to keep the filling moist and their technique works beautifully. Careful though, those little packets of yumminess are piping hot. The chicken dish was also quite good. Tender, thinly cut white meat with sliced mango, red pepper and snow peas in a tangy sauce. Although I really did enjoy all of the food- probably more than a lot of other uptown Chinese restaurants, I probably won’t ever go back because it’s ridiculously overpriced. One appetizer, one entree and one beer came to almost $50 with the tip. Outrageous, especially for the skimpy sized plates. Usually, you expect to take home abundant leftovers from a meal like this, but the portions were so small that we finished everything. The service was very good and the atmosphere allowed for lingering and chatting, but unless that’s worth $30 to you, go get the same meal somewhere else for $20.